Shawn Hattingh, 2014, “Exploding Anger: Workers’ Struggles and Self-Organization in South Africa’s Mining Industry,” in Immanuel Ness, editor, 2014, New Forms of Worker Organization: The Syndicalist and Autonomist Restoration of Class-Struggle Unionism, PM Press, Oakland, CA. The tragedy of the disintegration of the Congress of South African Trade Unions (COSATU) happened slowly. As tragedies go, COSATU’s has been far less dramatic than most; it has rather been a sad slow and painful unravelling of a once vibrant and powerful organisation over 20 odd years. The unravelling of an organisation that forgot that the whole is made up of the sum of its parts; that continuously made the mistake of allowing personalities to undermine democracy, ambition to undermine equity and bureaucracy to undermine equality and democratic participation. COSATU’s decay has had a significant impact on the South African working class. The impact has reverberated across the country in a myriad of ways and has been the result, both directly and indirectly, of COSATU’s failure to effectively and democratically represent the working class. This has been the case partly because of its alliance with the ANC and partly because of its (and the trade union movement in general’s) inherently defective organisational structure and patriarchal culture. 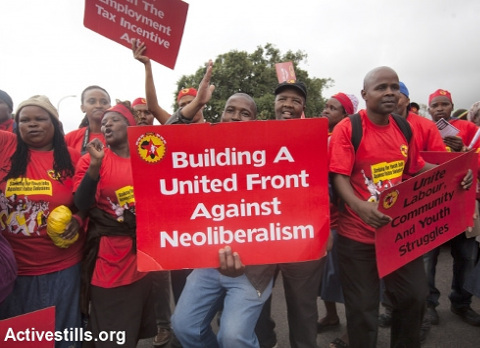 The resolution adopted by the National Union of Metalworkers of South Africa (NUMSA) to form a ‘United Front against neoliberalism’ – as well as its decision not to endorse the ANC in the elections – represents an interesting development in the political landscape, one which activists should look at carefully and engage. Due to the language used by the media, the Left, NUMSA’s critics and even NUMSA itself much confusion surrounds the debate – leaving many questions: Is the ‘United Front’ an organisation or attempt to build a new labour federation or political party? Is it an attempt to revive the 1980s United Democratic Front (UDF)? Why NUMSA’s sudden interest in community struggles? The xenophobic violence and looting following King Zwelithini’s statement that foreigners “pack their bags and leave” spread to cities and townships across the country. However, the recent attacks are not an isolated incident; nor is Zwelithini solely responsible for fomenting it. Local elites – particularly those linked to the ruling party – also encourage anti-immigrant attitudes and actions. This article, based on discussions with Abahlali baseFreedom Park activists, looks at how local elites stimulate ‘xenophobia’ to protect their class interests, as well as how progressive working class activists have responded. Part 4 in a series of articles on the concept and history of united fronts. A “revolutionary alternative from below” that was not quite to be but holds pertinent lessons for movements today. In 1919, the Social Democratic Party of Germany (SPD) organised the suppression of workers that, together with soldiers, had overthrown the German imperial government in the 1918-1919 German Revolution and brought an end to the First World War. The SPD restored capitalist and state power but, despite being brutally repressed by the SPD, the German working class continued to struggle against the government until 1923. Right-wing forces also wanted to oust the SPD-led government, recapture direct state control and reverse the results of the Revolution. In March, 1920, right-wing military forces occupied Germany’s capital, Berlin, under the leadership of Wolfgang Kapp and the SPD-led government fled. All left parties, excluding the KPD (German Communist Party), called for a general strike to counter the coup and defend democracy. Soon, the strike had spread across the country.